The Phēnix PHX Series of Outdoor LED Signs… bold, energy saving, LED illuminated backlit signs for bank lanes, parking garages, safety, warning signs and more. Backlit is back…better and brighter than ever before. As most folks know, before the age of LED, our backlit Neon TC traffic control signs reigned as the industry standard for bank lane signs, open closed, full, enter exit and safety signs. With the birth of the LED age, we were able to offer the TCL LED line of traffic control signs with brighter, more visible messages; lower energy consumption, less CO2 emissions…and customers enjoyed an annual 90% energy cost savings with each unit installed. For many, our TCL product line offered the signs of choice for banks, credit unions, parking garages, airports, warehouses and distribution centers. However, even with all these advantages, some customers yearned for the look of the ancestral neon units with their crisp, bold fonts…for some, a preferred choice over the look of the new-age naked LED’s. So, work began on a sort of rebirth to breed the next generation of backlit signs. The Phēnix LED Sign Series came into being…creating hybrid units with the best benefits of our innovative Led sign technology and the visual appeal of our neon TC heritage. The Phēnix brings outdoor-rated backlit LED signs to life with bold hearty fonts, vivid colors, and exceptional brightness using LED rebounded light that evenly illuminates the message. Powerful enough to be 50% brighter than most neon backlit units yet gentle on the environment, they consume 75% less energy than similar neon backlit signs. Phēnix LED signs will save consumers in operating costs year after year after year! We believe that the Phēnix is destined to greatness as your choice for outdoor-rated LED illuminated backlit signs. iSIGNS Inc, Fairview PA. More and more at iSIGNS, we are witnessing the trend by parking lots and parking garages to use signage, banners, and graphic elements to create customer appeal that moves them beyond yesterday’s somber, grey, unadorned concrete and asphalt. Our new Perma-Banner System makes it easy to create long-life, eye-catching, curb-appealing vertical banners used to adorn street poles and light or lamp posts along streets, entryways and throughout parking lots. They offer parking facilities a hot new wave of branding and marketing appeal that will provide increased visual impact, last for years, and be effortless to install and maintain. The Perma-Banner System makes it easy to create long-life, attention-grabbing street pole and lamp post banners for surface parking lots and the exterior of parking garages. Perma-Banner’s are easily customized with unique shapes and bold, bright graphics…perfect for adding color and messages; creating parking section designators; or for marketing and branding campaigns for communities, events and retail businesses. Their changeable panels will not fray, shred or tear. The system features our exclusive “No-Fly-Away” bracket and a 5-year warranty. Read the complete article as reprinted in Parking Today. iSIGNS Inc., Fairview, PA proudly announces the appointment of Mark Bosta as a Sales and Solutions Specialist. Mark officially joined iSIGNS on June 11th. He is a great asset to the company and his primary focus is to develop customer relationships and sign-project guidance. He will work to increase product knowledge and improve customer services within the company's growing North American network of distributors, dealers, contractors and sign providers. Mark has over fifteen years of customer service and management experience and brings a wealth of professionalism and enthusiasm to the iSIGNS team. Give Mark a call at 866-437-3040 to have him help with your next sign project or just to say hi. See how this sales professional will quickly become your "go to guy" for signs! "Welcome Mark...we are excited to have you on our team!" Please help us in welcoming Bill Burrows to our sales team. Bill comes to us with a wealth of experience and over 30 years in sales, including more than 5 years in the signage industry. He is very knowledgeable and will be able to help you with all your signage needs. He is a great addition to our team! We are excited to have Bill and we know you will enjoy working with him! 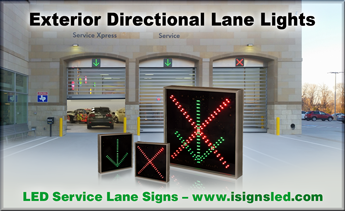 iSIGNS Inc, Fairview PA, adds Parking Guidance Signs to its website at http://www.isignsled.com to better serve the needs of its parking sign clients. These sign types are often taken for granted but they are an extremely important group of signs and messages for motorists and pedestrians. We have long offered an extensive line of eco-friendly signs for Parking Garages and Surface Parking Lots and we recognize the need for specialized signage to service the parking industry. 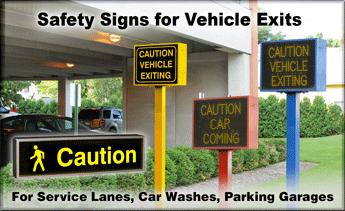 Parking facilities have a need for signs that carry simple graphics and messages to guide motorists and eliminate traffic confusion, and many of these signs are of custom design in regard to size, shape, and mounting. We want to make it easy to fill the need for proper parking signage and parking guidance signs…check out the examples on our new Parking Guidance Signs page. Entering 2012, we are continuing to expand our website as a fully loaded 24/7 portal to iSIGNS rapidly growing identity as a multi-faceted sign source. Have a parking sign item you need but can’t find? Email or call us toll free at 866-437-3040.
iSIGNS Inc, Fairview PA, invites you to take a look at the Perma-Banner System, a unique new technology for creating and hanging vertical street pole banners, light pole and lamp post banners. The system offers the most creative, long-life banners available today. These banners outperform and outlast fabric banners…and carry a 5-year warranty. Perma-Banners can be of any shape and feature an exclusive "No Fly Away" vertical mounting bracket that eliminates lost banners, electrical hazards and utility damages. Where can you sell Perma-Banners in your community?…Learn More.